It was sweet while it lasted. But we have another nice Voltaire collection you might enjoy: Spooky Songs For Creepy Kids. Very Limited edition “best of” cd in a 5″ cardboard cover. This disc was available in 2004 in the box with a Tower-Exclusive 8″ Deady figure. Only 1000 were made. In early 2004, Voltaire signed a deal with Toy2R (one of the leading companies in the world of collectable “urban vinyl” toys) to make figures from his DEADY graphic novels. The first toy, a 2-inch posable DEADY figure on a key chain for the company’s “Qee Bear” line was released at San Diego Comic Con. The toy was a great success and all 500 pieces of this limited edition Con exclusive sold out over the course of the 3-day convention. Encouraged by that success Voltaire struck a deal with Tower Records to create a much larger 8-inch DEADY figure to be sold at Tower in January of 2005! The minds at Toy2R, Tower and Wonder Wall got together and decided to include a “Best of Voltaire” CD FREE with the toy! 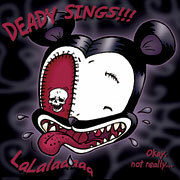 The CD is officially called DEADY SINGS!!! (and of course comes with the disclaimer “okay, not really!”) and it serves as the FIRST EVERY Voltaire sampler featuring some of Voltaire’s best material from his previously released albums on Projekt (The Devil’s Bris, Almost Human, Boo Hoo And Then And Again). DEADY SINGS!!! is the ultimate Voltaire sampler containing an average of 2 songs from each of Voltaire’s discs. Limited to 1000 copies, most of which were packaged with the figure. This a “must have” for any serious collector of Voltaire’s work!